The aroma of freshly baked bread filling your house of a morning is one of life’s true pleasures, not to mention the delicious taste. So why not try your hand at baking your own homemade loaves? 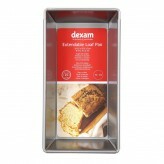 With our quality bread and loaf tins to help you, you are sure to find baking bread so easy, and whether you are set on perfecting the classic white or brown loaf, or are dying to try something a little more experimental, our range of loaf tins will not disappoint. 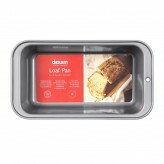 From a fantastic farmhouse loaf to a sensational sourdough, a sweet sticky bread to a brilliant baguette, whatever kind of bread you fancy, by using our professional, non-stick loaf tins, you’ll make sure that you’ve got the right tools necessary to make baking a pleasure. 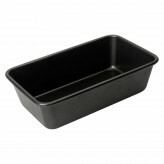 We stock classic loaf tins in which you can make a variety of different loaves, as well as all the baking accessories you need from rolling pins to honey dippers to help you create a delicious loaf of sweet or savoury bread. 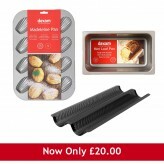 If you’re feeling more experimental and dare we say, exotic, why not take a look at our French baking set for mouth-watering Madeleines and sensational sponge biscuits? 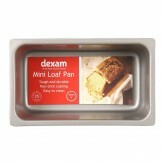 At Dexam, we pride ourselves on providing a range of bakeware and cookware products that are fantastic quality, brilliant value and have combined style and practicality to make sure your time spent in the kitchen is time well spent. 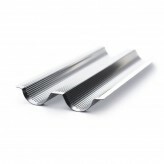 If you have any questions or comments about our bread and loaf tins, or need some advice, just get in touch with our friendly customer services team via email or by calling 01730 811888 - we’d be more than happy to help. 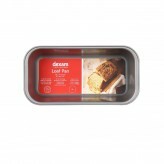 We are sure you’ll be delighted with our range of bread and loaf tins and be able to find the right tin to get you creating delicious bread in no time at all. If you need some inspiration on the kinds of loaves you could bake in your new bread tin, just take a look at our ideas for recipes below. You can also check out our handy blog for more cooking and baking tips!